RING-D SERIES The TUO Ring-D series is characterized by Japanese super steel, AUS-10 45 layer Damascus steel material and exceptional high-end touches.The full genuine exotic handle of Ring-D’s provides a contemporary look, secure grip and balance, and is easy to maintain.The excellent sharpness and good edge retention makes it so fast and easy to cut. The TUO Ring-D series is characterized by Japanese super steel, AUS-10 45 layer Damascus steel material and exceptional high-end touches. The full genuine exotic handle of Ring-D’s provides a contemporary look, secure grip and balance, and is easy to maintain. The excellent sharpness and good edge retention makes it so fast and easy to cut. Ring-D definitely gives every chef top cutting performance and versatility. Elegant –Classic and elegant visual appeal. 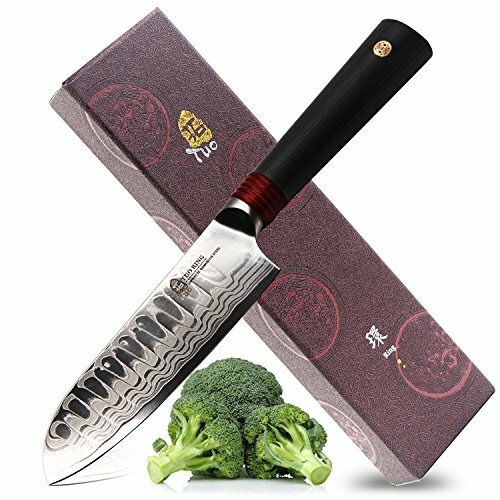 Japanese Steel– AUS-10 “high carbon Japanese stainless steel”, high quality steel for making professional kitchen knives. Sharpness – -Optimal angle designed with 15-degree cutting angle, for superior performance and easy maintenance. Exclusive Super Beautiful and Cool Dragon-Keel Damascus Pattern!! An ultra sharp AUS-10D Japanese super steel cutting core at 62+ Rockwell hardness ensures extraordinary performance and edge retention. The interior steel is painstakingly sandwiched between 44 layers of premium high-carbon stainless steel, resulting in exceptional strength, durability and stain resistance. Perfectly balanced and precisely tapered. The perfect santoku knife. The NEW Ultimate Santoku Knife: A TUO culinary revolution combining outstanding and award-winning craftsmanship, cutting-edge breakthrough technology, awe-inspiring design, and the absolute best materials available. Peak performance never looked so good at this price. A scalpel like edge is hand finished to a staggering 8-12°degree angle per side using the traditional 3-step Honbazuke method – No ordinary boning knife. Nitrogen cooled for enhanced harness, flexibility and corrosion resistance. Full tang for superb robustness and mosaic rivet applied even more resilience. Ultra-premium G-10 handle forms around the Santoku knife tang, and is impervious to heat, cold and moisture. Military grade with life-long durability. Handpolished ergonomic handle shape is engineered for superior hand control, agility and comfort all while promoting a natural pinch grip. Risk Free: 100% SATISFACTION OR MONEY BACK GUARANTEE, try it risk free. We guarantee a superior product that will give you a lifetime of exemplary service. With the luxury case it is also the wise choice as a gift(Christmas, weddings, birthdays, fathers day, mothers day), for culinary students, home cooks, professional chefs and more. Choose TUO , and NEVER STOP TUOING! Customer Video Review Length:: 1:21 Mins I had this To knife few days, I am using it to cut the rolls and side jobs, such as cut the cucumbers, avocados, vegetables, much easier and save time. HRC is 62 which can last the sharpness longer, and not easy to get broke.